Finally you can get a deer lure that is designed to work all season long but specifically before and after the rut. Remember deer know when the rut is alot better than you do, so don't spook them by using the wrong stuff at the wrong time. TotalSeason is perfect for the early bow season and the late black powder hunt. And there's nothing like it in states that have open seasons all summer right through January. Put it down the way deer do, and you'll be taggin' some nice deer this season. Follow Lure Placement Map. 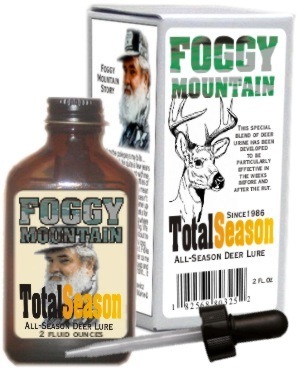 Saturate ScentTags with Total Season Deer Lure and hang just above or behind rocks, trees, bushes, logs etc. so that when the deer investigates, it will be in a good position for a clear shot Remember the goal of using Total Season is for early, late and non-rut seasons. Positioned correctly, it will draw deer off the game trail into position and distract it long enough for you to have a good, clean shot within your shooting comfort range. Remember also to bring your ScentTags in at night. You only want to attract the deer when you are there to hunt. Place hunting clothes in a plastic bag with a few drops of Pro-cover the night before you hunt. Squirt masking scents on soles of boots or saturate Foggy Mountain ScentTags and tie onto boot laces before walking into your stand.